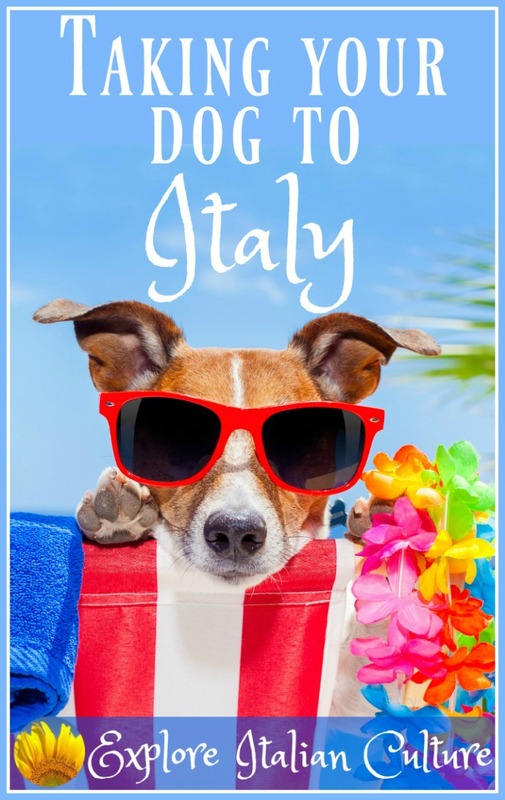 So you want to travel to Italy by sea with your dog? 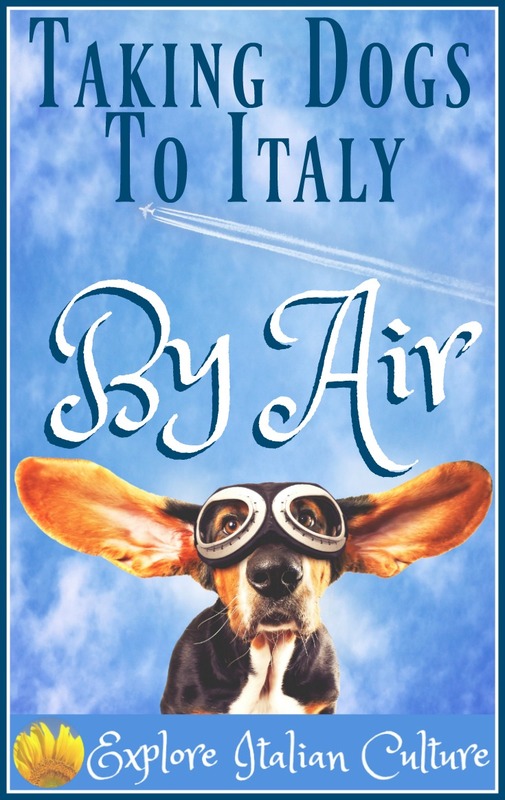 So you want to travel to Italy with your dog by sea? Whether you're planning to travel from America on the most luxurious of liners, cross by ferry from the UK via France, or take a tiny local Italian boat - we've got the details for you. First things first: is this a good way to travel for you and your dog? 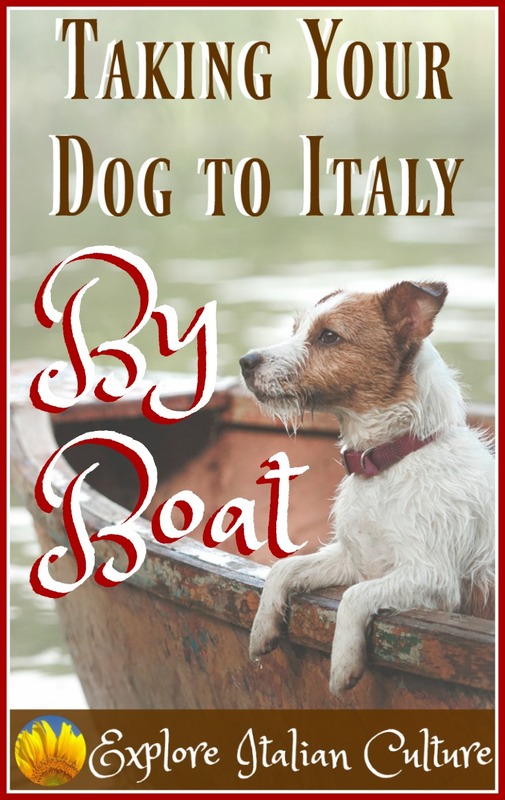 Travelling to Italy by sea is one of the best ways, for both you and your dog. It's generally stress-free, with the exception of the transatlantic route it's inexpensive, and you get to relax and unwind before your trip begins. And if you're travelling between the Italian mainland and islands you have the added advantage of some beautiful scenery on the way. On the Transatlantic crossing and ferries from the UK, your dog won't be able to travel on board with you. We cover this below. On local Italian crossings, that's not normally a problem although it's always advisable to check before you book. If your dog isn't used to travelling on water, there's always a possibility of seasickness. It's caused by the same problems with motion as car sickness, so if your dog has problems dealing with car journeys, she's likely to experience the same while at sea. It does tend to affect younger dogs more, as they've not yet fully developed their sense of balance. Watch out for excessive licking of the lips and yawning, and / or drooling, which are all symptoms. In extreme cases, vomiting will be an issue too. The best way of dealing with it is to try to desensitise the dog before you travel by taking her out for short trips in the car. Make those journeys as pleasant as possible, and lengthen the time you're out bit by bit. If you're really concerned about your dog travelling by sea, talk to your veterinarian about medication for motion sickness. Some have a sedative effect but others just help prevent the feeling of nausea and control vomiting. Here's what we cover in this article. Click on any of these links to go straight to that section. and can stay with their owner during crossings. All animals will be required to have the proper paperwork and inoculations. Click on this link for detailed information. The only transatlantic crossing which permits dogs (and cats) to travel is Cunard's Queen Mary 2 - and even then, only on the route between New York and Southampton, UK. From there, you'd need either to fly to Italy, or take a ferry crossing to France and then drive through Europe. The Queen Mary 2: luxury at sea - even for dogs and cats! The QM2 was completely refurbished in 2016 and now has a total of 12 luxurious kennels on board, staffed by a "Kennel Master" whose sole purpose is to keep all the animals in his care safe and happy for the duration of the journey. There's a play area and a walking area for the dogs, complete with lamp-post for wee-ing against, supplied by the city of Liverpool, UK (where Cunard's main offices are based). For American doggies not used to the British way of life, there's a fire hydrant direct from the city of New York. Pampered pooches also get a stylish fleece, complete with the QM2 logo, their own bowls and premium quality dog food. This short video (featuring Peanut the Corgi!) is fascinating, even if you can't afford luxury sea travel for your dog! It was made before the ship was refurbished but even so, gives a glimpse of what dogs can expect on board. Animals are not allowed anywhere apart from the kennels / cattery. Each pooch has its own kennel - which is actually a metal cage - and ship staff take responsibility for feeding, walking and taking care of your pet for the entire journey. You will be able to visit between certain hours, and walk your dog yourself if you'd prefer. Obviously, being separated for the entire journey is not something that's going to appeal to everyone. Friends who have done this route have also said they felt unable to relax properly during the journey because they were too worried about their pet. There is no veterinarian on board. The Kennel Master is qualified in animal welfare but does not have the facilities to treat sick animals. It should be stressed, though, that staff take ultra-good care of the dogs and cats on board. This is not a cheap option, and Cunard take their responsibilities towards all passengers, human and animal, very seriously. How to book a kennel on the QM2. Cunard suggest you'll need to reserve a kennel at least 12 months in advance of your trip. It's always worth checking, though, in case the journey is under-booked. This is a direct link to the Cunard page which explains exactly what you need to do to book either a dog or a cat into their kennels. Ferries to and from the UK. Getting to the ferry port. We have used this route to take our dogs to visit family in the UK at least once a year for the last ten years, so we know it well. You'll need to travel from Italy through France to the English Channel. We always go by car. You could travel up by train or plane, but because dogs are not allowed to travel with foot passengers, you would need to hire a car before you cross. There is another way to cross without your own car but it's extremely expensive. If you'd like to know more, contact us for information. The shortest crossing is between Calais (France) and Dover (UK). It takes just 90 minutes, but you need to check in at least an hour before your ship sails, especially if you're travelling from France to the UK. Travelling from Dover to Calais. Technically, your documents will be checked at the border, and your dog's microchip will be checked. In all the journeys we've done, that has never happened. A member of P&O ferry staff say "hello" to Luce, our Italian sheepdog, at the Dover ferry port. ...and no checks whatever on documents or the microchips. Why? It's right to say that concerns about rabies are concerns of the UK. You'll undergo checks when going into the country, but not when coming out of it. Nevertheless, it's critical that you have the proper documentation, just in case. You won't find any dog-friendly facilities at Dover. It's a good idea to let your dogs have a walk before boarding but you'll have to leash-walk them on the parking area. There's a café for humans, but no water bowl for dogs, so make sure you take your own. 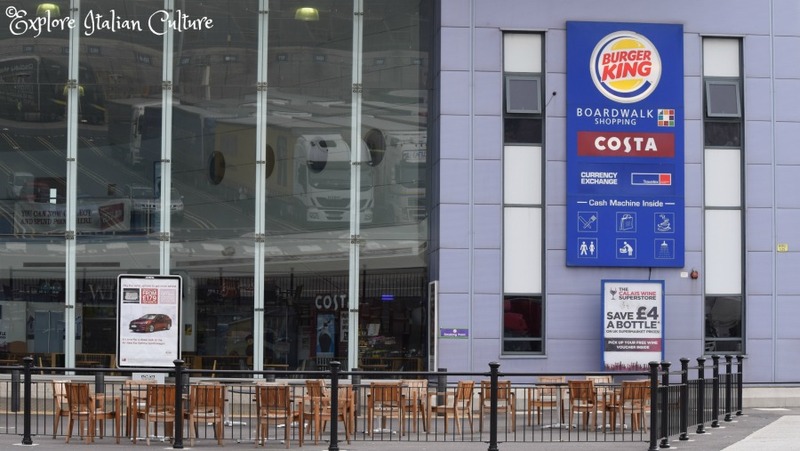 The rather unprepossessing café at the Dover ferry port - dogs are not allowed inside. Make sure you check-in at Calais at least an hour before sailing. Checks will be rigorous: you'll need to present your dog's EU passport (or travel certificates if you're travelling from outside the UK), showing a current rabies inoculation and a tick and worming treatment. You'll also need to scan your dog's microchip. If those documents and the chip are not in order, you will not be allowed into the UK. You will have the choice of returning to mainland Europe, or having your pet put into quarantine - at your expense. Don't risk it! Make sure everything is in order well before you travel. 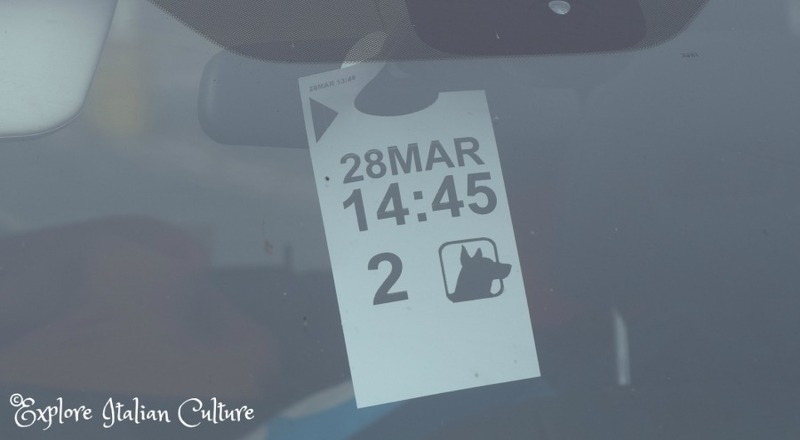 Once you've checked in, you'll be given a label to hang inside your car which indicates you have pets travelling with you. It's important that you display it - see below to know why. Taking dogs by car from Calais to Dover - a dog sign tells staff how many pets are in the car. We always use P&O Ferries. Their prices are very competitive and although they charge for dogs, it's relatively inexpensive. We've found them unfailingly efficient, facilities on board are good and when we once forgot to leave a window open in the car for our dogs, their staff picked up on it and informed us within minutes. Which has to mean they take notice of cars which have that sign in the window. Impressive. Animals are not allowed out of the car during the journey. They must remain secured in the vehicle throughout. The car deck being close to the engines must be pretty noisy during the crossing. We've never had any indication that our dogs have been distressed - in fact we've generally found them sound asleep when we return to the car at the end of the journey - but if you don't like to leave your pets, this is not the way to travel. Make sure you leave windows partly open, and give the dogs water before you leave the car. We leave Effie (our Yorkie) in her "girl cave", while Luce, our Maremma, has free run of the car boot (trunk). 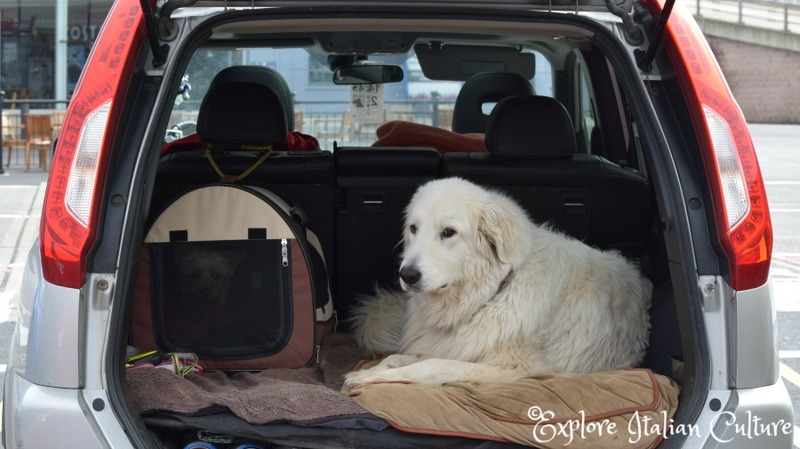 Our two dogs, Effie the Yorkie and Luce the Maremma, shortly before boarding the cross-Channel ferry. Service dogs, of course, are allowed on the ship with their person. How to book a cross-Channel ferry with dogs. The website for P&O Ferries is simple and their booking page is straightforward. Find it here. Local Italian transport by sea. Italy is a pretty dog-friendly country, and the ferries are no exception. We've always found that both our giant-sized dog, Luce the Maremma (52 kilos) and our tiny Yorkshire Terrier Effie (5 kilos) are made welcome on board local ferries in Italy. We have never been charged for taking the dogs on local ferries - they travel for free. It's always wise to check with the ferry operator before you book your tickets, though, just in case. Local ferries can be packed in the height of tourist season, particularly July and August. That can make travel difficult for humans and dogs alike. 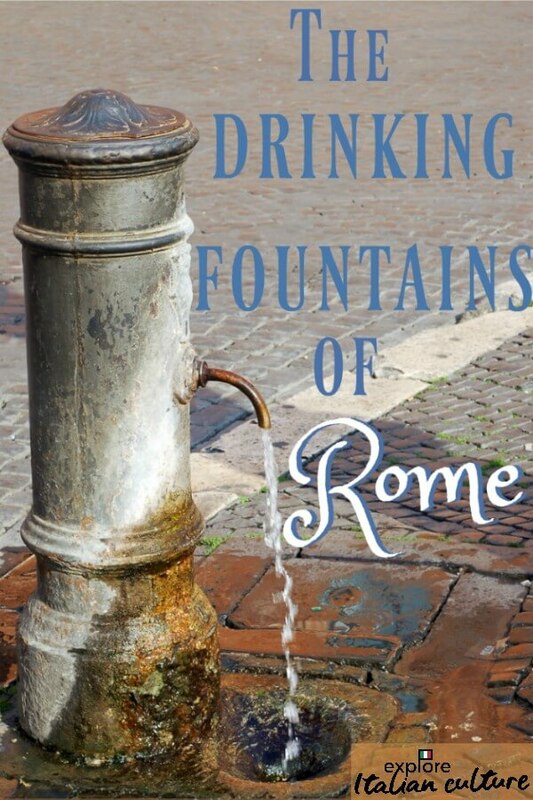 That's especially true of somewhere like Venice, when there's really no room to move. While that's not a problem for small dogs, large animals are best kept away from waterbuses and other small ferries during those times. Luce the sea-dog, on board a local ferry in the Cinque Terre. Effie is petrified by the engine noise, and spends her time finding comfort wherever she can - usually behind one of us, or clambering into my handbag. She likes to pretend it's not really happening. The obvious answer is not to take them on small boats that make a big noise. Car and train journeys can be less stressful and have the advantage of your pooch travelling in her own crate, which gives a sense of security. But in an Italian region like Cinque Terre, local ferries are really the only realistic mode of transport. Although trains run, they run mostly through tunnels and you'll miss out on the gorgeous scenery from a boat. 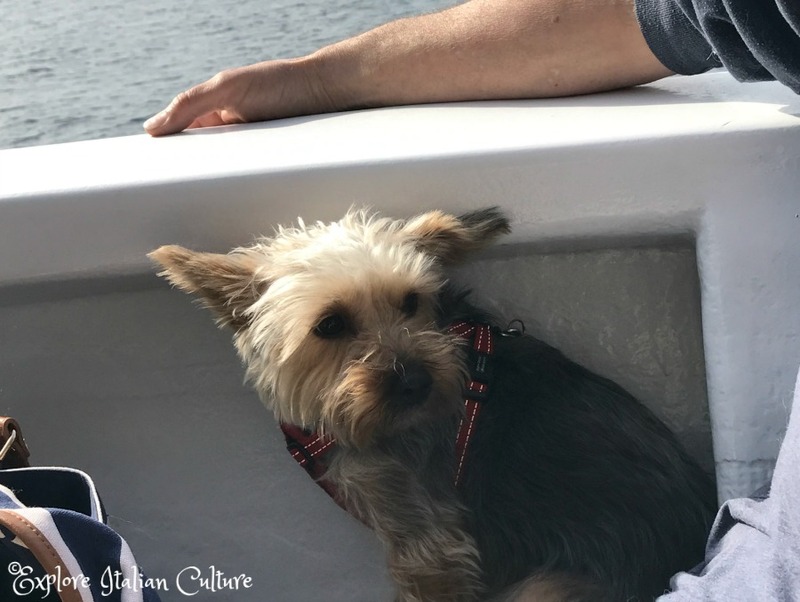 Effie the Yorkie, not a sea-dog, spends her time on local Italian ferries trying to pretend it's not happening. Effie is fine as soon as she hits dry land, and the journey times for most small ferries is very short. So as long as she's comforted and has somewhere safe to be, we've always judged it to be worth the stress. Natural medication is an option, but for short ferry crossings is really not worth the trouble. Recently, though, we've come across another answer. It wouldn't work for Luce but for Effie, it's ideal. Normally, of course, we'd want her to walk. But for short periods like this when she's just too scared to be comfortable, the sling carries her close to our body which makes her feel more secure. These are Amazon's most highly rated dog slings. Reviews are mixed no matter which you buy. We've chosen the Kangapooch. We're still testing this, and as soon as we've made a decision about whether or not it's working, we'll post a review. Make sure to bookmark this page and come back to it once we publish it. Prefer to take your pet by air? No problem. Click on any of these links to go to that article.